Panoramic views of the Hudson River and the Empire State building as well as the 65 foot skylight are sure to inspire. 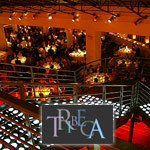 The 15,000 sq foot event space at the Tribeca Rooftop is urban yet versatile. Get more for your wedding! Don't forget to mention ChossonKallah.com when visiting Tribeca Rooftop.